Some of Wales' finest Impressionist masterpieces from a renowned collection by the Davies sisters are to go on a five-site tour of the US. Altogether 58 works, some never seen in the US, are being included in the tour, which opens in Columbia next March. They will also be shown in Oklahoma City, Syracuse, New York, Washington DC, and Albuquerque, New Mexico. Heritage Minister Alun Ffred Jones said he was hopeful the US display will impact on Wales and its tourism. "These paintings will not only put Wales on the map at an international level, but will inspire, entertain and educate millions in the future," he said. "This exciting and powerful exhibition will capture the public imagination and will tell one of the greatest stories ever told by Wales." Art patrons and spinster sisters Gwendoline and Margaret Davies, from mid Wales, gathered an impressive collection, ranging from Old Masters to the work of contemporary British artists, which they later bequeathed to Wales' national museum. 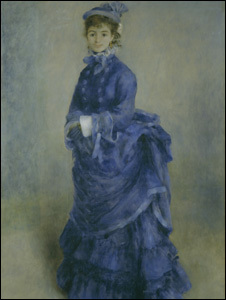 In the early years of the last century, the sisters were among the most important British collectors of progressive French art, with a particular fondness for the late work of Monet. The touring US exhibition opens with an introductory group of works by Turner, provides a deeply personal vision of French painting from the Realists to the Post-Impressionists, and finished with a small section of avant-garde pre-World War I British art. Oliver Fairclough, guest curator of the exhibition, and the Keeper of Art at National Museum Wales, said: "We are delighted to be able to present this important exhibition to five different venues in the US." He added it offered visitors "the chance to see incredibly beautiful works of art by some of the world's greatest Impressionist and Post-Impressionist artists for the first time." AFA Director Julia Brown said the exhibition "will be a visually stunning survey of the evolution of modern art through key examples of the stylistic innovations that shaped the art of the 19th century." While this large body of art is on tour National Museum Cardiff says it will still have an "exciting and varied programme" for visitors. 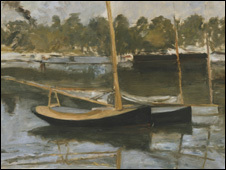 Exhibitions in 2009 include Sisley in England and Wales charting two different painting campaigns of the painter, who lived for a time in south Wales. That opens in March and later in 2009 visitors will be able to view exhibitions concentrating on contemporary art, including one dedicated to the work of award-winning children's author and illustrator Lauren Child. Michael Houlihan, director general of National Museum Wales, said improvements were being made in the way the nation's art collection is displayed. "We're looking at how we can show more art, present popular works in fresh ways and explore new ideas."